Many know him as the charming owner of Loyal Hair Therapy, a busy local beauty salon. But Loyal Wooldridge is also fast becoming known for his sincere commitment to community through philanthropy. To commemorate the 10 year anniversary of Loyal Hair Therapy, Wooldridge and his team hosted “A Decade of Empowerment” on Sat. Nov. 19 at the luxe new Lexus Kelowna dealership. The highlight of the evening’s festivities was when local media celebs Klaudia Van Emmerick and Cheryl Gillespie picked up the clippers and ‘styled the stylists’, leaving Wooldridge and a new addition to the Loyal team, Colin Ford, as bald as…. well… babies! Prior to the event, Wooldridge and Ford took to social media to raise donations for the impending head shave. In a generous twist, event attendance was opened up to the entire community, with tickets by donation. There was also a very special sentiment surrounding the celebration. After all the dancing, fashion show, live auction and head-shaving were done, $9,250 was raised. 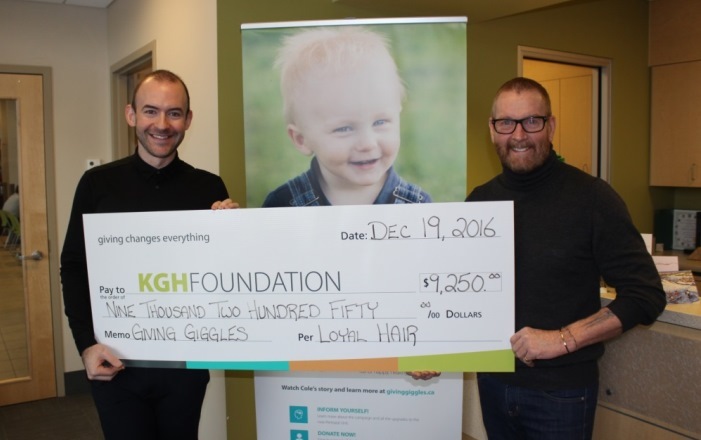 The funds were gifted to the KGH Foundation’s Giving Giggles campaign, designated specifically for the purchase of state-of-the-art medical equipment and patient care items for the NICU at KGH where every year, hundreds of pre-term and sick infants spend their first several weeks of life. Giving Giggles A touching story wraps up the $3 million campaign.